Yesterday was the start of something different. I’m playing a game where, if you have the friends, you can level in five hours. It’s strangely familiar yet scarily different place to be, with so much to learn and gather and take in… it’s a bit daunting to start with. It always is, as I recall, these first few days of finding your feet and working out what to do first. Needless to say there are always those who want to get there before anyone else. I’ve been there and done that, but I didn’t enjoy being rushed, so this time I decided that the best thing to do is to take it at my pace and to enjoy the parts of the game I love the most: the gathering and the crafting. If you ignore the leather (and the Ogre Tannin, you never know when you’ll need a Ogre Suit after all…) you’re looking at what will be the building blocks of all crafted gear on Azeroth of any value for the next X months, the Volatiles. As you can see, I am yet to find a reliable source of Volatile Air (all on it’s lonesome awww) but I’m guessing the two zones I’ve not yet even thought about will supply a source. My mate Basil’s already told you just how important these things will be and it’s a foolish woman who doesn’t understand that as a crafter you can’t do anything without these, and the last thing you want to be doing is buying them on the AH for quite some time. This has meant that while P has been working her way through Underwater World (I know I said she was going to Hyjal but my husband decided he fancied swimming first, more on this later) I sent M the Rogue out to Wintergrasp. Yes, you read that right, I ground 450-500 skills in both Mining and Herbalism in a quiet and unfussed environment. Nothing worse than going to a new zone, hitting or collecting and finding your skill is too low, after all. Once properly armed I headed for Hyjal (as much for a look see as anything else) and spent the best part of yesterday afternoon gathering. The results mean I have started Jewelcrafting and Inscription as well as Alchemy, with a supply of ore on standby for Engineering once the Royal Mail get around to delivering my second copy of the Expansion. 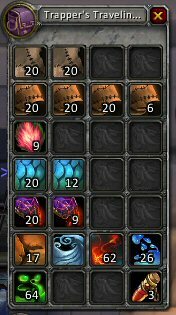 Leatherworking on P is already a healthy 505 with a Cloak of Beasts waiting in the bank for when I get to 83. FOUR Pyrite!!! That’s… er… 4 more than I thought I’d get! I have noticed a distinct change in the mentality for gathering: before one would need to be mindful of wandering beasts near nodes, which if you worked at low level could be a hindrance. 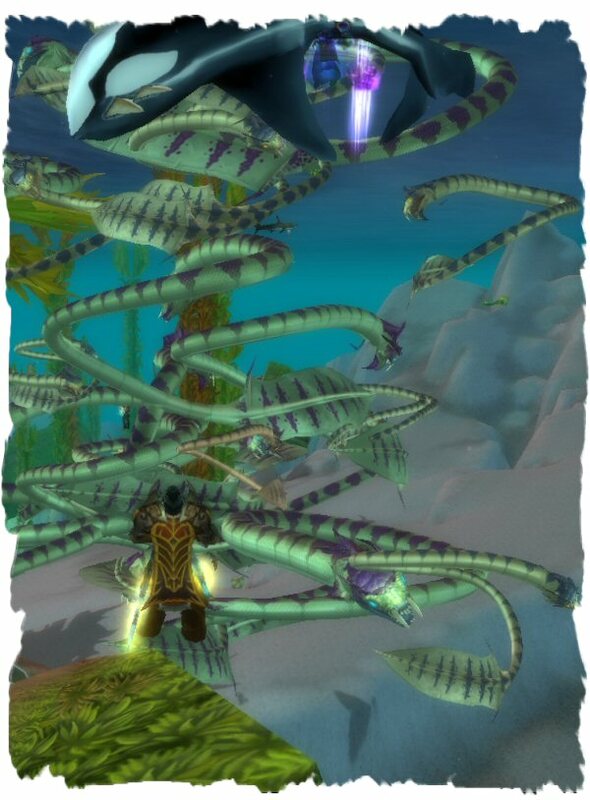 With so much of Cataclysm operating in phased realities there seems to be little or no issue with getting to nodes in even the most inaccessible places, though the phasing itself can cause some comedy issues of it’s own (a spot in Hyjal springs to mind where you can see a node from one area but it disappears as you phase into the next, and it’s impossible to mine it from the unphased side ^^) Needless to say even at peak times yesterday it was not a problem to get raw materials. 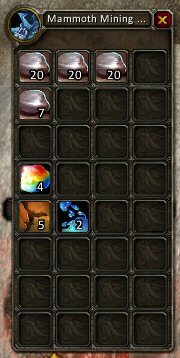 As a skinner, it’s a bit like Christmas in the starting zones: I spent ninety minutes skinning crabs even before I started questing on Wednesday morning (our realm first L80 took 11 hours btw) and I’m told that in Hyjal (where I’ll need to go for the Blackened Dragonscale I need for Hunter Gears) it’s just as mental. If anyone wondered why Blizzard don’t give skinners XP, there’s the reason. There’s also been some fishing and some exploring on P but currently I’m saving the questing for the evenings so myself and my husband can level together. I have to say, without a doubt, this is the most fun I’ve had levelling with him since Vanilla. There have been issues (of which I will address in a separate post) but in the main it’s just been AWESOME. For now the time I have in the day is all about making things, and I don’t think I’ve ever been happier as a result.